This interesting surname is of early medieval French origin and is an example of that sizable group of early European surnames that were gradually created from the habitual use of nicknames. Hassett is a Northern Irish variant of the name Hasard, which would have been given to a gambler or a brave or foolhardy man who was prepared to run risks. The derivation is from the Old French, and Middle English "hasard", game of chance, a word originally derived from the Arabic "az-zahr", from az, an assimilated form of the definite article, "al" and "zahr", die. It would appear that this word was brought to Europe by Provencal crusaders. 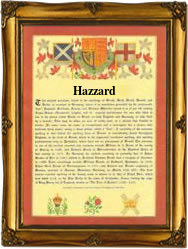 Other variants include Haz(z)ard, Hassard, Assard, and Hazart. It may also be that Hassett derives from the Old English pre 7th Century "hals", neck, and given to a person with some peculiarity of the neck. Among the early recordings in London is the christening of Abygaell Blever Hassett on July 11th 1580 at St. Lukes, Chelsea, and the marriage of John Hassett and Sarah Godfrey on October 12th 1675 at St. Mary Magdalene, Old Fish Street. The first recorded spelling of the family name is shown to be that of Hugo Hasard, which was dated 1170, in the Pipe Rolls of Hampshire, during the reign of King Henry 11, known as "The Builder of Churches", 1154 - 1189. Surnames became necessary when governments introduced personal taxation. In England this was known as Poll Tax. Throughout the centuries, surnames in every country have continued to "develop" often leading to astonishing variants of the original spelling.